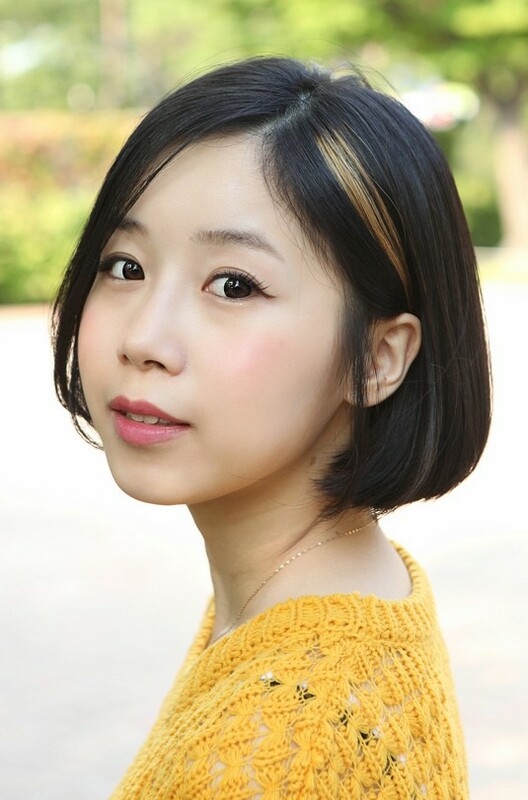 Latest trendy short Japanese bob hairstyle: This short, cute bob was blunt-cut in one-length from a slightly off-centre parting. 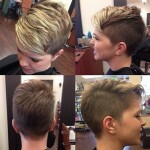 The front of the hair was styled to make a softly angled asymmetric frame for the face, with the longer side just brushing the client’s cheekbones and curving in at chin level. Adding a fabulous quirky contrast, the client’s lovely dark hair was given a dramatic golden blonde highlight and casually styled behind the ear, drawing attention to the eyes, with a casual strand left free in front of the the ear. The hair was blow-dried to give a touch of volume and a very attractive curve just under the jaw, accentuating the mouth and chin! The result is a style which flatters the client’s face shape beautifully and this well-proportioned haircut is perfect for petite girls and women!